HomeChoice Planners and Construction Corporation takes part in the Fire Prevention celebration. In line with this month’s celebration, HPCC has invited some guests from the city’s Fire Department office. It is to give the construction workers lectures and drills on how to prevent a fire and kill it if in case you’re caught up in an emergency situation. Last March 11, 2013, three officers from the Fire Department discussed to the workers all that there is to know about fire. Officer Te, the first to stand in front, talked about the definition of fire; including its classes and composition. He also discussed to the workers the different categories of fire in which it gives us insight on how to respond and stop the fire depending on its type. 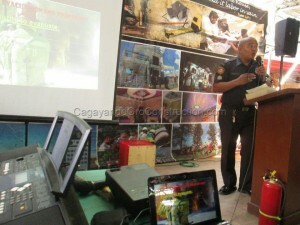 Officer Te shared ways on how to prevent and stop fire; in which he included the proper use of the fire extinguisher. The next officer to talk was Officer Salvana, wherein he showed the workers an organizational structure of the volunteer fire brigade and explained the importance of it. Reflected on this structure are the designated people responsible when emergency situation arises. These people have different tasks needed to fulfill when fire breaks out. After the organizational structure topic, Officer Baang took over the stage and shared some additional information. When the officers finished their lecture, the fun and exciting part started; fire drill. The workers were much cooperative in the said drill, showing enthusiasm by volunteering in the demonstration. 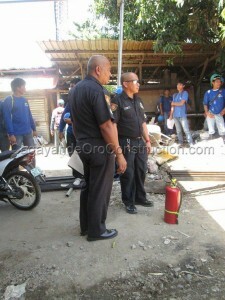 The officers demonstrated to the workers the right way of putting out a fire using wet cloth and fire extinguisher. The workers definitely learned a lot from the lecture and drill. They are sure fired up when faced in an emergency situation.